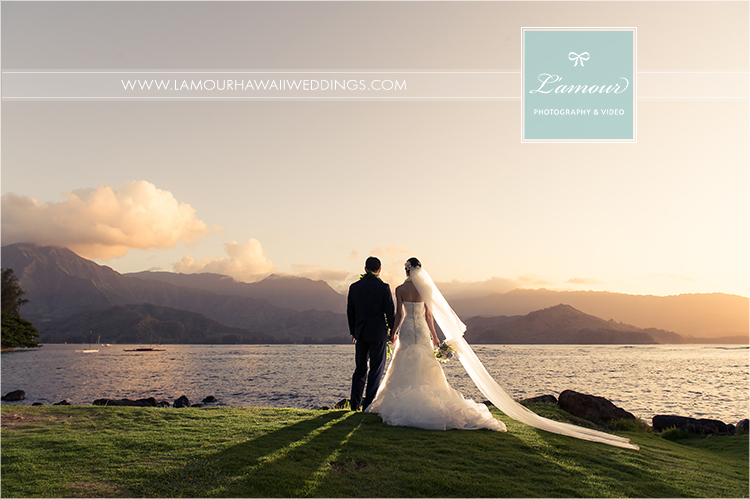 We are happy to share part 2 of these Kauai wedding photos! 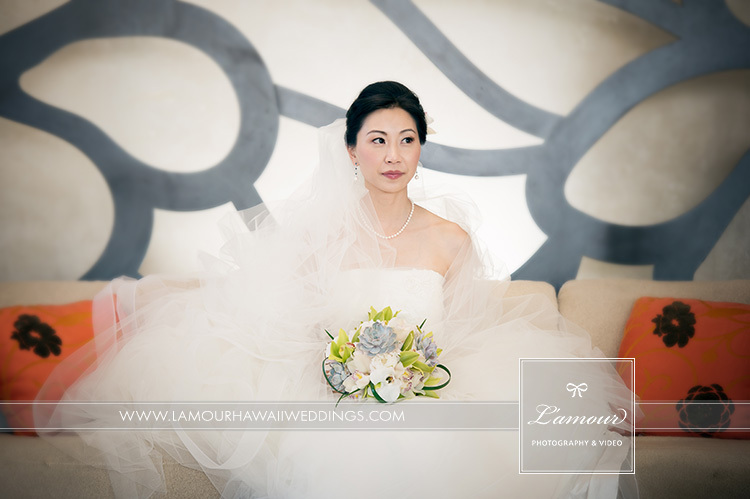 Click here to see part 1 of this Hawaii wedding photography blog post. 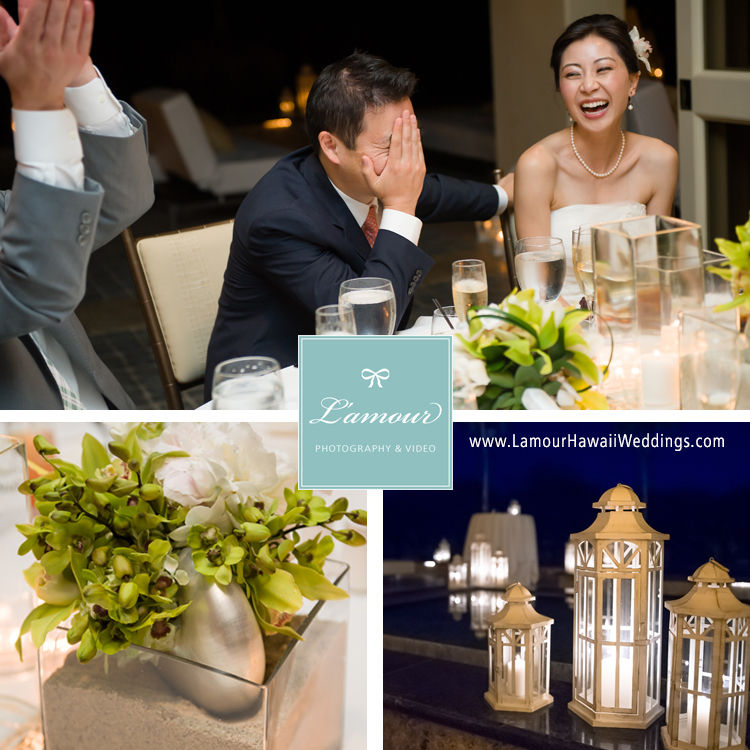 In our first post of this wedding we showed some of our favorite photos from this lovely bride and groom’s wedding rehearsal sunset dinner cruise of the Napali coast and all of the wedding preparations on the morning of this Hawaii destination wedding in Kauai. The bridesmaids wore a light green knee length dress accented with a coral colored sash giving their look a classy yet tropical twist. The flower girls walked down the aisle holding poms of green orchids on a white satin string. 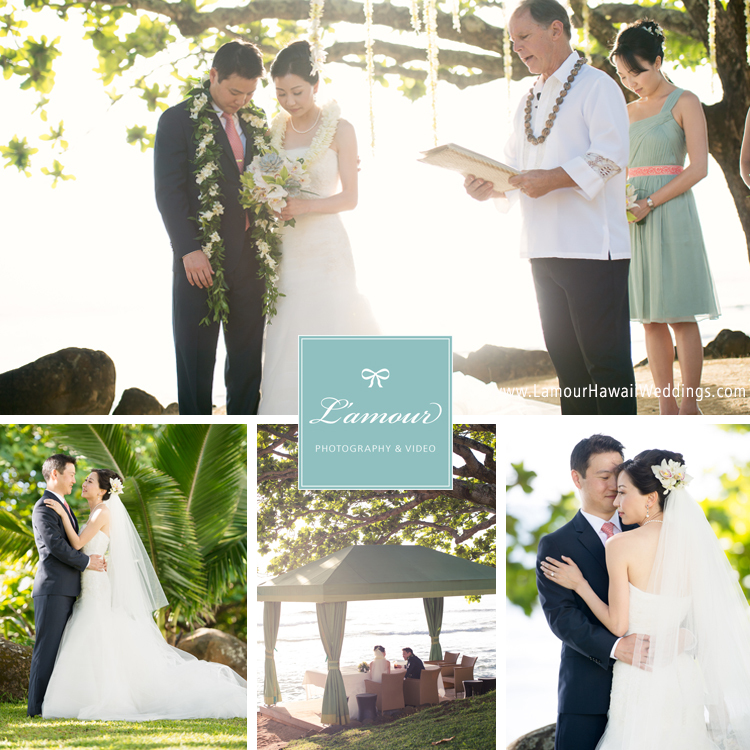 This Hawaii wedding ceremony took place under the large trees on the edge of the beach fronting the St Regis. 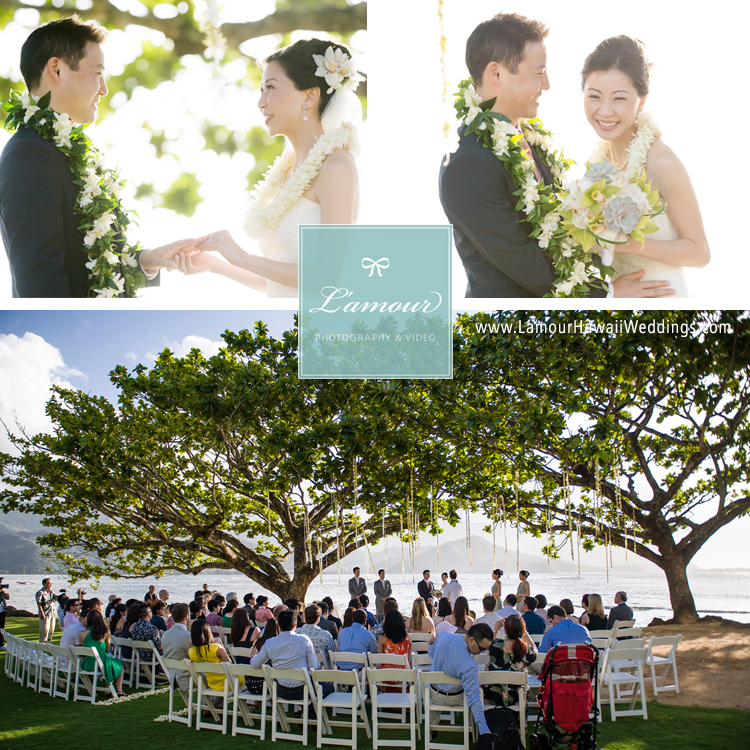 Lei of tropical flowers and crystal strands hung from the tree branches as the happy bride and groom exchanged vows beneath at the Kamani Cove. 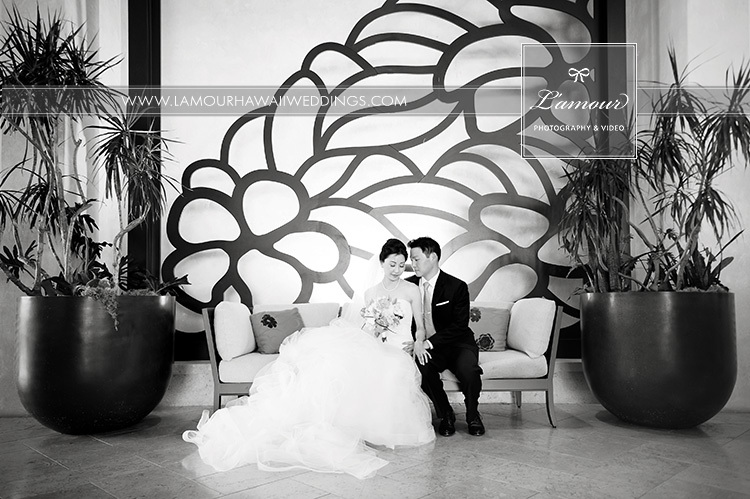 Right after the beachfront wedding ceremony, we went around the gorgeous grounds of the St Regis to photograph the bride and grooms wedding portraits. 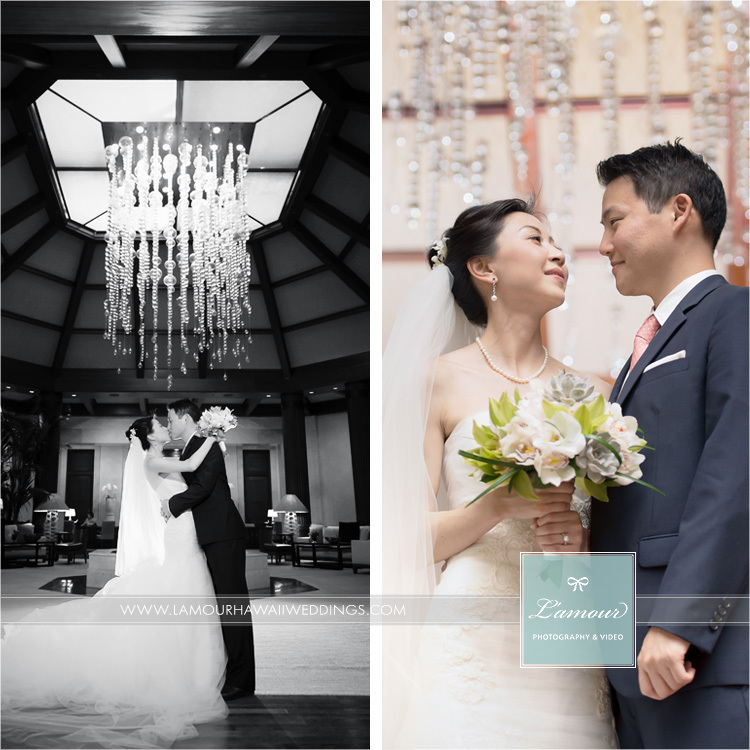 We were struck by the many stunning locations and really loved the sparkling glass bulb chandelier of the lobby as well as the graphic decor in the front of the main entrance to this amazing resort. 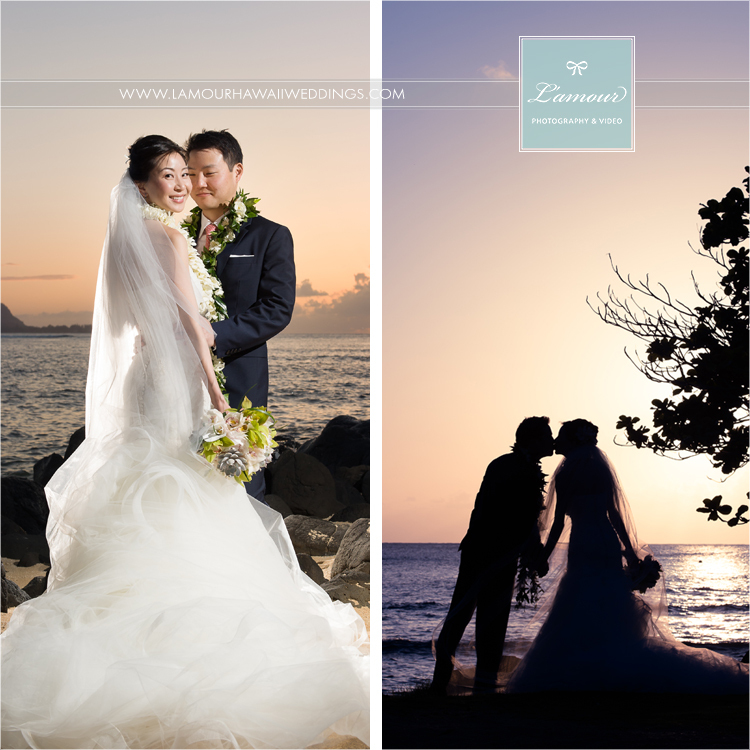 Sunset was absolutely stunning on this Hawaii wedding day. The sun rays perfectly caught on the mountains across Hanalei Bay. 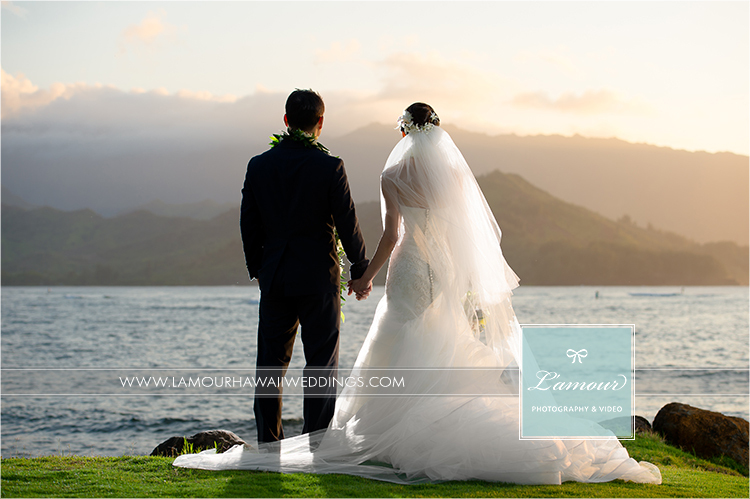 This Hawaii wedding reception was held in the St Regis Bay Terrace overlooking the sun setting over Hanalei Bay. 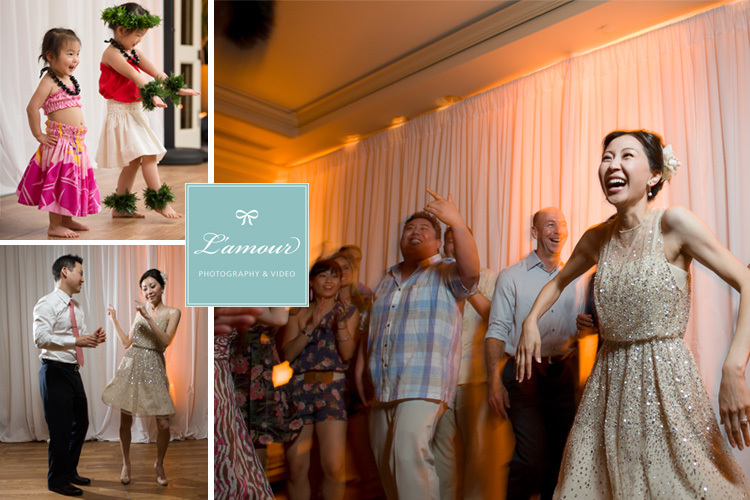 This Hawaii wedding venue features a relaxing lounge area with an attached ballroom giving this venue indoor and outdoor versatility. 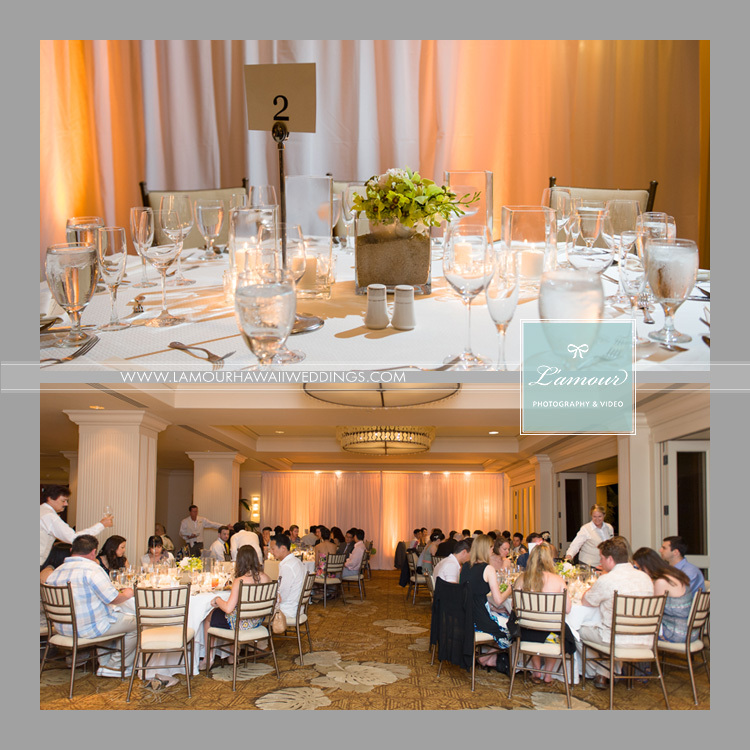 The wedding reception carried the same classic beach theme with warm gold up-lighting sand filled centerpieces with large shells holding the tropical green and white flowers. 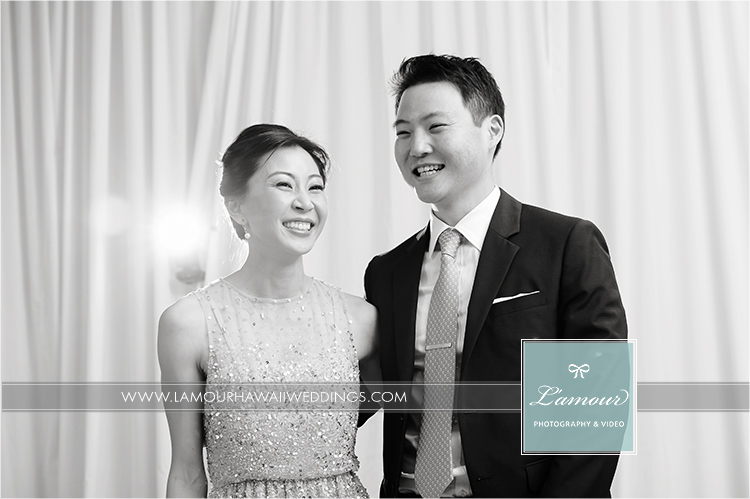 This beautiful bride changed into a knee length sparkling gold dress for her wedding reception. This dress was prefect for busting a move for their choreographed first dance. Not only was this bride and groom super sweet, but they also knew how to have a good time and let loose! Any bride who breaks out into doing the robot during her own wedding is a bride after my own heart! Here we are with the gorgeous couple! We are extremely lucky and blessed to have such amazing people as our clients. 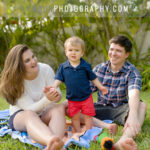 After 5 years in business, based on Oahu, we continue to be amazed at how we always get to photograph such wonderful couples. Thanks for being AMAZING, everyone! Ps: As a side note, you might notice that we have changed our watermarking of photos recently. Don’t worry! We only are putting these watermarks on our blog posts. Our clients receive their printable, full size photos, free from any watermarks on their CD and with a much much less obtrusive watermark on their smaller, web-sized set of photos. Finally, we wanted to mention that Wendy (shown above with Eric) is only able to photograph weddings every once in a while when her carpal tunnel problems allow, and this was one of those rare occasions! 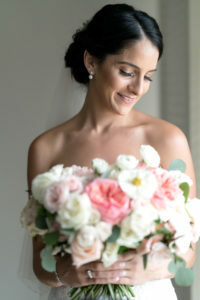 She spends most of her days editing all of the Hawaii wedding photos and working on the flush-mount wedding album designs! 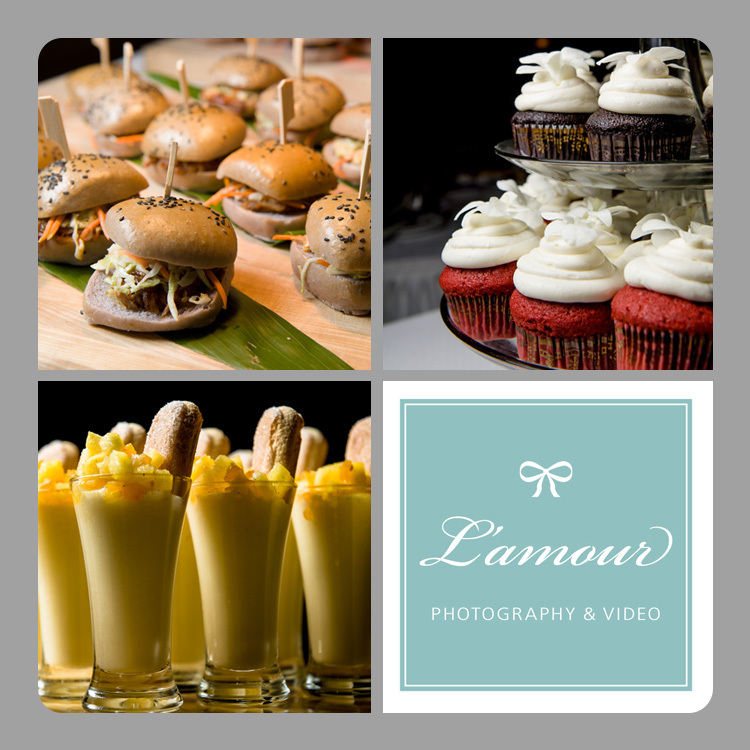 Our absolutely talented L’amour team members photograph and film all of the rest of the weddings, day in and day out, through the years. 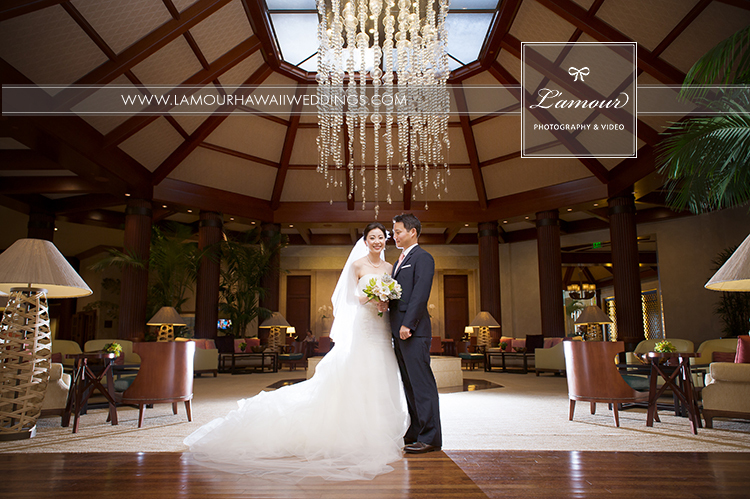 This entry was posted in Venues, Weddings and tagged Bride, ceremony, destination wedding, groom, Hawaii Wedding Photographer, Hawaii Wedding Reception, Kauai, Portraits, Reception, St Regis Princeville, sunset. Bookmark the permalink. 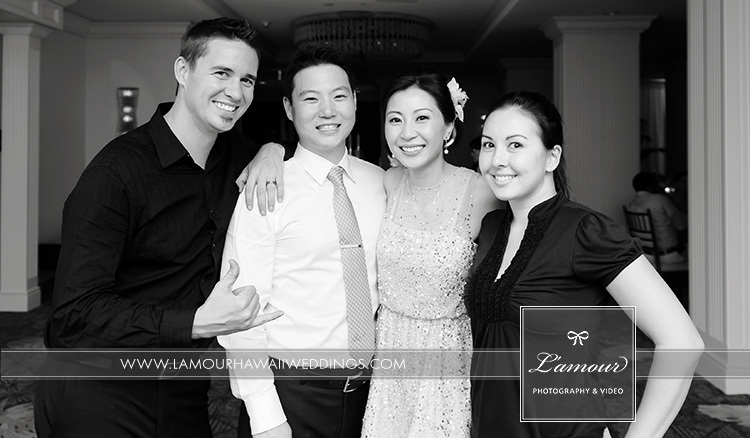 ← Hawaii Wedding Photographer – L’amour is on Facebook!